Halloween is over but does your child’s trick-or-treat basket still have tons of candy in it? Rather than deal with upset tummies from children eating too much candy or trying to deal with the whines that follow candy rationing, I decide to put some of these sweet treat to good use. We did science experiments with candy! We tried a simple experiment with sinking and floating. We learned that Hershey kisses sink. My son reasoned that the fun size 3 Musketeer bar was even bigger and therefore he assumed it would be heavier than the Hershey kiss and therefore it would also sink. It floats! We realized why when we saw the air bubbles float to the top of the water. 3 Musketeers are fluffy which means there is air in there. The air makes it less dense than the water and therefore it floats. 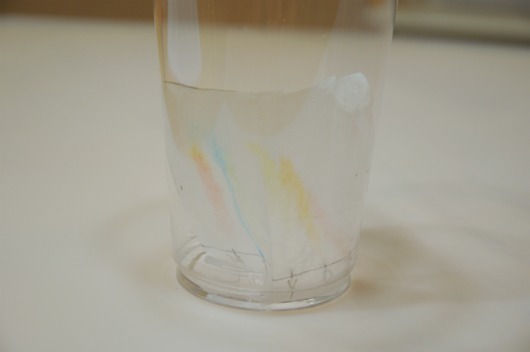 That was a fun and simple experiment but we also tried something a little more complex…Candy Chromatography! The word “chroma” means color and “graph” means to write or document. So this experiment is documenting the true colors of our candy. We chose M&Ms as our test subject. There are 6 colors of M&Ms – red, orange, yellow, green, blue, and brown. However, those dye colors are not listed as ingredients. Instead, other colors are blended to make these 6 beautiful colors. But which colors are found in each? 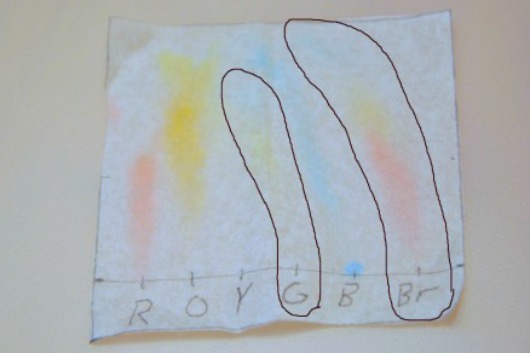 That’s what candy chromatography is going to tell us! First Nicholas put 6 drops of water on a tray and placed one of each color M&M on a drop. He let them sit there for about a minute which let the dye dissolve into the water. When he removed the candies, there were 6 colored drops of water made from the mixture of dyes in each of the candies. 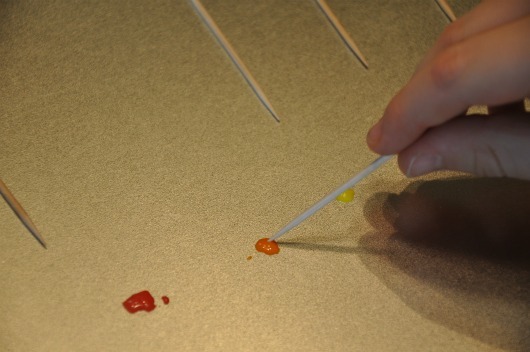 Nicholas used a toothpick as a paintbrush to pick up a drop of one color at a time. Each color got its own toothpick. 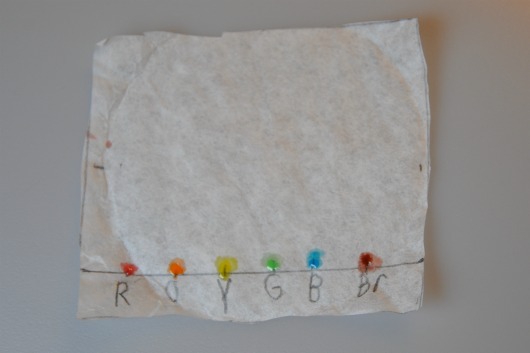 He placed each drop of dye on a square piece of paper coffee filter that had been labeled for each color. The piece of filter was approximately 3 inches x 3 inches. He dabbed color on each spot three times, letting it dry between applications. The colors are on a line that is about 1/2 inch from the bottom of the coffee filter square. Next, Nicholas mixed up a low concentration of salt water, about 1 %. We kept the math simple and mixed 3 cups of water with 1/8 teaspoon of salt. It was way more solution than we needed but I didn’t have a way to measure less than 1/8 teaspoon of salt. He poured about 1/4 inch of water in the bottom of a clear cup and placed the filter paper into the solution with the dots of dye towards the bottom of the cup. We watched the solution travel up the filter paper carrying the dye with it. As the dye traveled up the paper we talked about capillary action. This occurs where liquid defies gravity and pulls itself upwards through a thin tube or narrow openings such as in the coffee filter. We noticed that some of the dye colors remained the same such as red and blue. However, although faint, we could see that green separated into yellow with some blue at the top. Brown was the most obvious of the dyes that separated. It shows red at the bottom, yellow in the middle, and blue at the top. Some dyes travel farther than others because they are more attracted to the salt solution and want to remain with it as it moves upwards such as the blue dye here. Other dyes such as red are more attracted to the paper medium and stay more stationary. This was a fun experiment to do with M&Ms but you could also do it with Skittles, colored markers, Kool-Aid, etc. 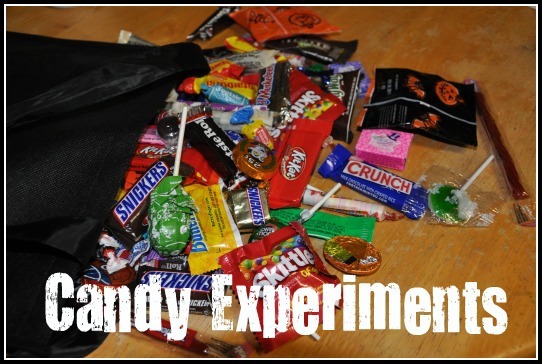 We still have plenty of candy left over so I’d love to hear about any experiments you have tried with candy. This is such a cool experiment! Did you wait for the drops of dye to dry before you put them in the salt solution or did you just put them in wet? This is so cool! What fun! So incredibly awesome! The science major deep inside me is jumping for joy at these ideas! Thanks for sharing. Erin, he put the dye on the paper and let it dry then he repeated that two more times. After it was completely dry, he added it to the solution. Fun! Two things I like about this: It’s a great learning opportunity and my kid eats less candy! Of course, my other strategy for getting my kid to eat less candy is to sneak into the bag at night and eat as much as I can, but I think this is better. I’ve got a science background and really appreciate all the great ideas you come up with and share here. Hi, I use this technique in secondary school using felt tip pen, but this idea is so great that I’m going to propose it to my students. I didn’t understand why you use water with salt and not only water. Mammozza, I’ve seen this done with plain water, salt water, and even a water/alcohol solution. I don’t know how the different solutions actually affect the experiment. Sorry. My wife and I home school. She’s going to love the ideas found on this site. Thanks for sharing! I recently heard about candy inspired recipes, but candy inspired science is a brilliant idea! I have a whole website devoted to candy experiments–there are a dozen on my experiments page (including chromatography and Sink/Float, which you have already discovered), and many more in my blog entries. I’d love for you to try them and tell me what you think. I also have seen instructions for M&M chromatography that call for salt water. I’ve tried it with both, and I get a good enough result with plain water I usually just use that. The difference in using water, salt water, or an alcohol solution, is that the substances dissolve differently in different solutions. Something that doesn’t dissolve well in water might dissolve much better in alcohol, and so chromatography in that case would work better with alcohol. Wow! That is so amazing! I would love it if you’d link this up on my blog carnival Family Time Tuesday!